It's that time of year again. 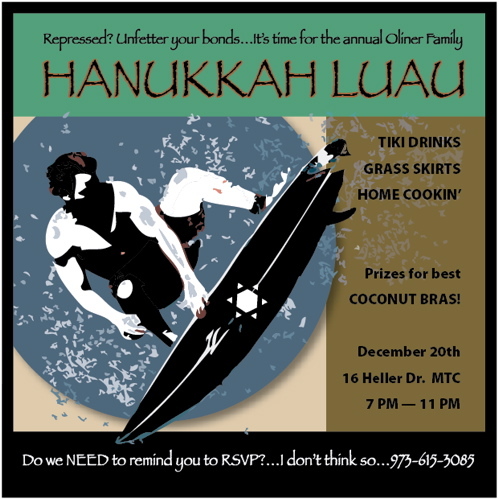 Time for the annual Hanukkah Luau. 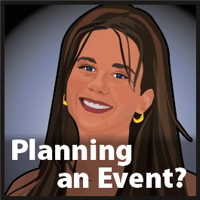 This began years ago when I wasn't quite sure how to throw a Hanukkah party and threw in the Luau portion to cover up any mistakes I made! 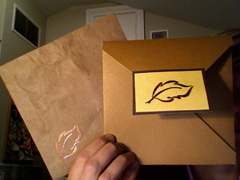 I actually cut out the envelopes and card stock and made that psuedo-embossed bronze colored leaf on the flap. I created the envelope out of crumbled supermarket paper bags to give it a rough beachy look. I also wanted to respect the economy and go green by cutting and creating my own invites for this yearly party. 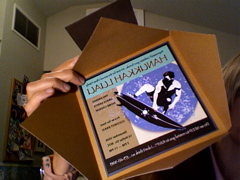 Look at that, I took the photos of the invites with my Mac camera and it looks like they need to be flipped!